Before making an appointment please completely read this page to make sure you qualify to be seen. Having an appointment does not guarantee that we will be able to assist you financially. We are located in the East Lake community serving the Greater Birmingham area! We are right next door to Woodlawn Piggly Wiggly, directly across the street from Willis Tire (large green building)! 1. Reside in the Greater Birmingham area. 3. The following information is considered when trying to make the decision for financial assistance. The goal of our ministry is to financially help someone that is not receiving assistance from other agencies or utility assistance from the government. Having an appointment does not guarantee financial assistance. Financial assistance and/or food assistance is only allowed two times per year (once every 6 months). We will consider utility assistance from the following companies: Alabama Power, Alagasco, Trussville Utilities, and Birmingham Water Works. Utilities must be on and all deposits, reconnect fees, establishment fees, and previous location service must be paid in full before consideration. No assistance is considered for sewer or appliances. We do not pay late fees. The person whose name is on the bill must be present when requesting assistance, not a third party. Our goal is to try to keep your utility services on - if we cannot do that then we will not be able to assist at this time with a partial payment. If you have received any other utility assistance within the last 6 months you do not qualify for assistance with us. This includes: section 8 utility check, assistance from another ministry, church, or agencies such as JCCEO. If you are requesting assistance with Birmingham Water Works & are on disability or over the age of 55 you need to call the water company & ask about the H2O Foundation for help. We will not be able to assist on your bill. If you qualify with JCCEO for financial assistance, you will NOT qualify for financial assistance with Serving You Ministries. We aim to cover the gap for those that do not qualify through other agencies. 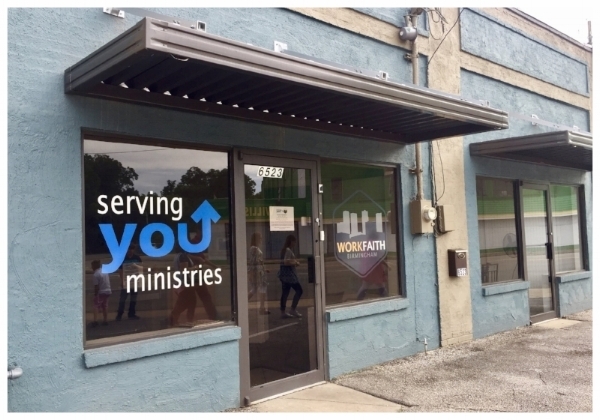 If you take a class through WorkFaith Birmingham, Hope Inspired Ministries or M-Power Ministries, Serving You Ministries will be able to take an additional look at your bills. 1. A government issued photo identification card. 2. Notice of Action Food Stamp Award Letter (as seen above) OR Birth Certificates and/or Social Security Cards for every individual in your household. Serving You Ministries does not discriminate against race, religion, or economical status. Our mission is to assist our neighbor during difficult circumstances.